A data center (American English) or data centre (British English) is a building, dedicated space within a building, or a group of buildings used to house computer systems and associated components, such as telecommunications and storage systems. Since IT operations are crucial for business continuity, it generally includes redundant or backup components and infrastructure for power supply, data communications connections, environmental controls (e.g. air conditioning, fire suppression) and various security devices. A large data center is an industrial-scale operation using as much electricity as a small town. Data centers have their roots in the huge computer rooms of the 1940s, typified by ENIAC, one of the earliest examples of a data center. Early computer systems, complex to operate and maintain, required a special environment in which to operate. Many cables were necessary to connect all the components, and methods to accommodate and organize these were devised such as standard racks to mount equipment, raised floors, and cable trays (installed overhead or under the elevated floor). 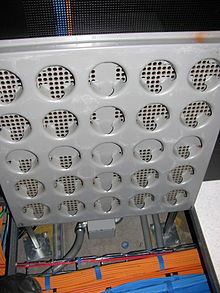 A single mainframe required a great deal of power, and had to be cooled to avoid overheating. Security became important – computers were expensive, and were often used for military purposes. Basic design-guidelines for controlling access to the computer room were therefore devised. During the boom of the microcomputer industry, and especially during the 1980s, users started to deploy computers everywhere, in many cases with little or no care about operating requirements. However, as information technology (IT) operations started to grow in complexity, organizations grew aware of the need to control IT resources. The advent of Unix from the early 1970s led to the subsequent proliferation of freely available Linux-compatible PC operating-systems during the 1990s. 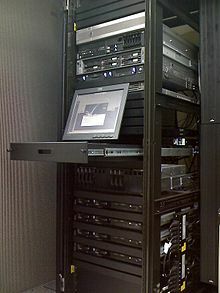 These were called "servers", as timesharing operating systems like Unix rely heavily on the client-server model to facilitate sharing unique resources between multiple users. The availability of inexpensive networking equipment, coupled with new standards for network structured cabling, made it possible to use a hierarchical design that put the servers in a specific room inside the company. The use of the term "data center", as applied to specially designed computer rooms, started to gain popular recognition about this time. The boom of data centers came during the dot-com bubble of 1997–2000. Companies needed fast Internet connectivity and non-stop operation to deploy systems and to establish a presence on the Internet. Installing such equipment was not viable for many smaller companies. Many companies started building very large facilities, called Internet data centers (IDCs), which provide commercial clients with a range of solutions for systems deployment and operation. New technologies and practices were designed to handle the scale and the operational requirements of such large-scale operations. These practices eventually migrated toward the private data centers, and were adopted largely because of their practical results. Data centers for cloud computing are called cloud data centers (CDCs). But nowadays, the division of these terms has almost disappeared and they are being integrated into the term "data center". With an increase in the uptake of cloud computing, business and government organizations scrutinize data centers to a higher degree in areas such as security, availability, environmental impact and adherence to standards. Standards documents from accredited professional groups, such as the Telecommunications Industry Association, specify the requirements for data-center design. Well-known operational metrics for data-center availability can serve to evaluate the commercial impact of a disruption. Development continues in operational practice, and also in environmentally-friendly data-center design. Data centers typically cost a lot to build and to maintain. Modernization and data center transformation enhances performance and energy efficiency. Information security is also a concern, and for this reason a data center has to offer a secure environment which minimizes the chances of a security breach. A data center must therefore keep high standards for assuring the integrity and functionality of its hosted computer environment. Industry research company International Data Corporation (IDC) puts the average age of a data center at nine years old. Gartner, another research company, says data centers older than seven years are obsolete. The growth in data (163 zettabytes by 2025) is one factor driving the need for data centers to modernize. Focus on modernization is not new: Concern about obsolete equipment was decried in 2007, and in 2011 Uptime Institute was concerned about the age of the equipment therein. By 2018 concern had shifted once again, this time to the age of the staff: "data center staff are aging faster than the equipment." The Telecommunications Industry Association's Telecommunications Infrastructure Standard for Data Centers specifies the minimum requirements for telecommunications infrastructure of data centers and computer rooms including single tenant enterprise data centers and multi-tenant Internet hosting data centers. The topology proposed in this document is intended to be applicable to any size data center. Data center transformation takes a step-by-step approach through integrated projects carried out over time. This differs from a traditional method of data center upgrades that takes a serial and siloed approach. The typical projects within a data center transformation initiative include standardization/consolidation, virtualization, automation and security. Standardization/consolidation: Reducing the number of data centers and avoiding server sprawl (both physical and virtual) often includes replacing aging data center equipment, and is aided by standardization. Virtualization: Lowers capital and operational expenses, reduce energy consumption. Virtualized desktops can be hosted in data centers and rented out on a subscription basis. Investment bank Lazard Capital Markets estimated in 2008 that 48 percent of enterprise operations will be virtualized by 2012. Gartner views virtualization as a catalyst for modernization. Automating: Automating tasks such as provisioning, configuration, patching, release management and compliance is needed, not just when facing fewer skilled IT workers. Securing: Protection of virtual systems is integrated with existing security of physical infrastructures. The term "Machine Room" is at times used to refer to the large room within a Data Center where the actual Central Processing Unit is located; this may be separate from where high-speed printers are located. Air conditioning is most important in the machine room. Aside from air-conditioning, there must be monitoring equipment, one type of which is to detect water prior to flood-level situations. One company, for several decades, has had share-of-mind: Water Alert. The company, as of 2018, has 2 competing manufacturers (Invetex, Hydro-Temp) and 3 competing distributors (Longden,Northeast Flooring,, Slayton). A raised floor standards guide named GR-2930 was developed by Telcordia Technologies, a subsidiary of Ericsson. Although the first raised floor computer room was made by IBM in 1956, and they've "been around since the 1960s," it was the 1970s that made it more common for computer centers to thereby allow cool air to circulate more efficienctly. The first purpose of the raised floor was to allow access for wiring. The "lights-out" data center, also known as a darkened or a dark data center, is a data center that, ideally, has all but eliminated the need for direct access by personnel, except under extraordinary circumstances. Because of the lack of need for staff to enter the data center, it can be operated without lighting. All of the devices are accessed and managed by remote systems, with automation programs used to perform unattended operations. In addition to the energy savings, reduction in staffing costs and the ability to locate the site further from population centers, implementing a lights-out data center reduces the threat of malicious attacks upon the infrastructure. The two organizations in the United States that publish data center standards are the Telecommunications Industry Association (TIA) and the Uptime Institute. The Telecommunications Industry Association's TIA-942 standard for data centers, published in 2005 and updated four times since, defined four infrastructure levels. Level 4 - designed to host the most mission critical computer systems, with fully redundant subsystems, the ability to continuously operate for an indefinite period of time during primary power outages. Major data centers did not appear in India until the late 1990s. space, power, cooling, and costs in the data center. Mechanical engineering infrastructure - heating, ventilation and air conditioning (HVAC); humidification and dehumidification equipment; pressurization. Electrical engineering infrastructure design - utility service planning; distribution, switching and bypass from power sources; uninterruptible power source (UPS) systems; and more. Site selection: Location factors include proximity to power grids, telecommunications infrastructure, networking services, transportation lines and emergency services. Others are flight paths, neighbouring uses, geological risks and climate (associated with cooling costs). Often available power is hardest to change. Various metrics exist for measuring the data-availability that results from data-center availability beyond 95% uptime, with the top of the scale counting how many "nines" can be placed after "99%". Modularity and flexibility are key elements in allowing for a data center to grow and change over time. Data center modules are pre-engineered, standardized building blocks that can be easily configured and moved as needed. A modular data center may consist of data center equipment contained within shipping containers or similar portable containers. Components of the data center can be prefabricated and standardized which facilitates moving if needed. indirect cooling, such as using outside air, Indirect Evaporative Cooling (IDEC) units, and also using sea water. Backup power consists of one or more uninterruptible power supplies, battery banks, and/or diesel / gas turbine generators. To prevent single points of failure, all elements of the electrical systems, including backup systems, are typically fully duplicated, and critical servers are connected to both the "A-side" and "B-side" power feeds. This arrangement is often made to achieve N+1 redundancy in the systems. Static transfer switches are sometimes used to ensure instantaneous switchover from one supply to the other in the event of a power failure. Raised floor cabling, for security reasons and to avoid the addition of cooling systems above the racks. 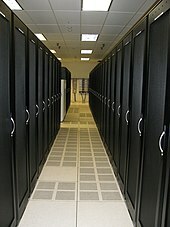 Smaller/less expensive data centers without raised flooring may use anti-static tiles for a flooring surface. Air flow management addresses the need to improve data center computer cooling efficiency by preventing the recirculation of hot air exhausted from IT equipment and reducing bypass airflow. There are several methods of separating hot and cold airstreams, such as hot/cold aisle containment and in-row cooling units. Typical cold aisle configuration with server rack fronts facing each other and cold air distributed through the raised floor. Computer cabinets are often organized for containment of hot/cold aisles. Ducting is intended to prevent cool and exhaust air from mixing within server rooms. Rows of cabinets are paired to face each other so that cool air can reach the equipment air intakes and warm air can be returned to the chillers without mixing with the cold air supply. An alternative to above floor containment is below floor air flow control. A range of underfloor panels can be fitted within the raised floor plenum to create efficient cold air pathways direct to the raised floor vented tiles. Either the cold aisle or the hot aisle can be contained. Another alternative method of containment is equipment cabinets with vertical exhaust duct (chimney) Hot exhaust exits the cabinet through the vertical exhaust duct, directing the air into a plenum above a drop ceiling and back to the cooling units or to outside vents, isolating the hot air from the room. With this configuration, traditional hot/cold aisle configuration is not a requirement. Data centers feature fire protection systems, including passive and Active Design elements, as well as implementation of fire prevention programs in operations. Smoke detectors are usually installed to provide early warning of a fire at its incipient stage. No water - some of the benefits of using chemical suppression (clean agent fire suppression gaseous system). Physical access is usually restricted. Layered security often starts with fencing, bollards and mantraps. Video camera surveillance and permanent security guards are almost always present if the data center is large or contains sensitive information. Fingerprint recognition mantraps is starting to be commonplace. Logging access is required by some data protection regulations; some organizations tightly link this to access control systems. Multiple log entries can occur at the main entrance, entrances to internal rooms, and at equipment cabinets. Access control at cabinets can be integrated with intelligent power distribution units, so that locks are networked through the same appliance. Energy use is a central issue for data centers. Power draw ranges from a few kW for a rack of servers in a closet to several tens of MW for large facilities. Some facilities have power densities more than 100 times that of a typical office building. For higher power density facilities, electricity costs are a dominant operating expense and account for over 10% of the total cost of ownership (TCO) of a data center. Power costs for 2012 often exceeded the cost of the original capital investment. Greenpeace estimated worldwide data center power consumption for 2012 as about 382 billion kWh. Global data centers used roughly 416 TWh in 2016, nearly 40% more than the entire United Kingdom; USA DC consumption was 90 billion kWh. In 2007 the entire information and communication technologies or ICT sector was estimated to be responsible for roughly 2% of global carbon emissions with data centers accounting for 14% of the ICT footprint. The US EPA estimates that servers and data centers are responsible for up to 1.5% of the total US electricity consumption, or roughly .5% of US GHG emissions, for 2007. Given a business as usual scenario greenhouse gas emissions from data centers is projected to more than double from 2007 levels by 2020. The most commonly used energy efficiency metric of data center energy efficiency is power usage effectiveness (PUE), calculated as the ratio of total power entering the data center divided by the power used by IT equipment. It measures the percentage of power used by overhead (cooling, lighting, etc.). The average USA data center has a PUE of 2.0, meaning two watts of total power (overhead + IT equipment) for every watt delivered to IT equipment. State-of-the-art is estimated to be roughly 1.2. Google publishes quarterly efficiency from data centers in operation. The U.S. Environmental Protection Agency has an Energy Star rating for standalone or large data centers. To qualify for the ecolabel, a data center must be within the top quartile of energy efficiency of all reported facilities. The Energy Efficiency Improvement Act of 2015 (United States) requires federal facilities — including data centers — to operate more efficiently. California's title 24 (2014) of the California Code of Regulations mandates that every newly constructed data center must have some form of airflow containment in place to optimize energy efficiency. European Union also has a similar initiative: EU Code of Conduct for Data Centres. The focus of measuring and analyzing energy use goes beyond what's used by IT equipment; facility support hardware such as chillers and fans also use energy. In 2011 server racks in data centers were designed for more than 25 kW and the typical server was estimated to waste about 30% of the electricity it consumed. The energy demand for information storage systems was also rising. A high availability data center was estimated to have a 1 mega watt (MW) demand and consume $20,000,000 in electricity over its lifetime, with cooling representing 35% to 45% of the data center's total cost of ownership. Calculations showed that in two years the cost of powering and cooling a server could be equal to the cost of purchasing the server hardware. Research in 2018 has shown that substantial amount of energy could still be conserved by optimizing IT refresh rates and increasing server utilization. In 2011 Facebook, Rackspace and others founded the Open Compute Project (OCP) to develop and publish open standards for greener data center computing technologies. As part of the project Facebook published the designs of its server, which it had built for its first dedicated data center in Prineville. Making servers taller left space for more effective heat sinks and enabled the use of fans that moved more air with less energy. By not buying commercial off-the-shelf servers, energy consumption due to unnecessary expansion slots on the motherboard and unneeded components, such as a graphics card, was also saved. In 2016 Google joined the project and published the designs of its 48V DC shallow data center rack. This design had long been part of Google data centers. By eliminating the multiple transformers usually deployed in data centers, Google had achieved a 30% increase in energy efficiency. In 2017 sales for data center hardware built to OCP designs topped $1.2 billion and are expected to reach $6 billion by 2021. Power is the largest recurring cost to the user of a data center. Cooling is at or below 70 °F (21 °C) wastes money and energy. Furthermore, overcooling equipment in environments with a high relative humidity can expose equipment to a high amount of moisture that facilitates the growth of salt deposits on conductive filaments in the circuitry. A power and cooling analysis, also referred to as a thermal assessment, measures the relative temperatures in specific areas as well as the capacity of the cooling systems to handle specific ambient temperatures. A power and cooling analysis can help to identify hot spots, over-cooled areas that can handle greater power use density, the breakpoint of equipment loading, the effectiveness of a raised-floor strategy, and optimal equipment positioning (such as AC units) to balance temperatures across the data center. Power cooling density is a measure of how much square footage the center can cool at maximum capacity. The cooling of data centers is the second largest power consumer after servers. The cooling energy varies from 10% of the total energy consumption in the most efficient data centers and goes up to 45% in standard air-cooled data centers. An energy efficiency analysis measures the energy use of data center IT and facilities equipment. A typical energy efficiency analysis measures factors such as a data center's power use effectiveness (PUE) against industry standards, identifies mechanical and electrical sources of inefficiency, and identifies air-management metrics. However, the limitation of most current metrics and approaches is that they do not include IT in the analysis. Case studies have shown that by addressing energy efficiency holistically in a data center, major efficiencies can be achieved that are not possible otherwise. This type of analysis uses sophisticated tools and techniques to understand the unique thermal conditions present in each data center—predicting the temperature, airflow, and pressure behavior of a data center to assess performance and energy consumption, using numerical modeling. 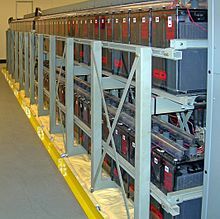 By predicting the effects of these environmental conditions, CFD analysis in the data center can be used to predict the impact of high-density racks mixed with low-density racks and the onward impact on cooling resources, poor infrastructure management practices and AC failure or AC shutdown for scheduled maintenance. Thermal zone mapping uses sensors and computer modeling to create a three-dimensional image of the hot and cool zones in a data center. This information can help to identify optimal positioning of data center equipment. For example, critical servers might be placed in a cool zone that is serviced by redundant AC units. This water-cooled data center in the Port of Strasbourg, France claims the attribute green. Data centers use a lot of power, consumed by two main usages: the power required to run the actual equipment and then the power required to cool the equipment. Power-efficiency reduces the first category. Cooling cost reduction from natural ways includes location decisions: When the focus is not being near good fiber connectivity, power grid connections and people-concentrations to manage the equipment, a data center can be miles away from the users. 'Mass' data centers like Google or Facebook don't need to be near population centers. Arctic locations can use outside air, which provides cooling, are getting more popular. Renewable electricity sources are another plus. Thus countries with favorable conditions, such as: Canada, Finland, Sweden, Norway  and Switzerland, are trying to attract cloud computing data centers. It is very difficult to reuse the heat which comes from air cooled data centers. For this reason, data center infrastructures are more often equipped with heat pumps. An alternative to heat pumps is the adoption of liquid cooling throughout a data center. Different liquid cooling techniques are mixed and matched to allow for a fully liquid cooled infrastructure which captures all heat in water. Different liquid technologies are categorised in 3 main groups, Indirect liquid cooling (water cooled racks), Direct liquid cooling (direct-to-chip cooling) and Total liquid cooling (complete immersion in liquid). This combination of technologies allows the creation of a thermal cascade as part of temperature chaining scenarios to create high temperature water outputs from the data center. Dynamic Infrastructure provides the ability to intelligently, automatically and securely move workloads within a data center anytime, anywhere, for migrations, provisioning, to enhance performance, or building co-location facilities. It also facilitates performing routine maintenance on either physical or virtual systems all while minimizing interruption. enabling cloud and grid computing. Communications in data centers today are most often based on networks running the IP protocol suite. Data centers contain a set of routers and switches that transport traffic between the servers and to the outside world which are connected according to the data center network architecture. Redundancy of the Internet connection is often provided by using two or more upstream service providers (see Multihoming). Some of the servers at the data center are used for running the basic Internet and intranet services needed by internal users in the organization, e.g., e-mail servers, proxy servers, and DNS servers. Network security elements are also usually deployed: firewalls, VPN gateways, intrusion detection systems, and so on. Also common are monitoring systems for the network and some of the applications. Additional off site monitoring systems are also typical, in case of a failure of communications inside the data center. Onsite is traditional, and one major advantage is immediate availability. uploading the data "into the cloud"
For quick deployment or disaster recovery, several large hardware vendors have developed mobile/modular solutions that can be installed and made operational in very short time. ^ "An Oregon Mill Town Learns to Love Facebook and Apple". The New York Times. March 6, 2018. ^ "Google announces London cloud computing data centre". BBC.com. July 13, 2017. ^ James Glanz (September 22, 2012). "Power, Pollution and the Internet". The New York Times. Retrieved 2012-09-25. ^ a b Sparsh, Mittal,. "Power Management Techniques for Data Centers: A Survey". ^ a b c Angela Bartels (August 31, 2011). "Data Center Evolution: 1960 to 2000". 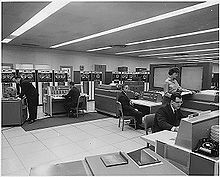 ^ Til the early 60s, it was primarily the government that used computers, which were large mainframes housed in rooms that today we call datacenters. 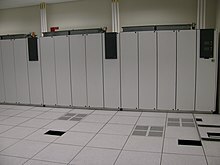 ^ In the 1990s, Minicomputers, now called servers, were housed in the old computer rooms (now called data centers). "Server rooms" were built within company walls, co-located with low-cost networking equipment. ^ a b c Cynthia Harvey (July 10, 2017). "Data Center". Datamation. ^ There was considerable construction of Data Centers during the early 2000s, in the period of expanding dot-com businesses. ^ a b "Mukhar, Nicholas. "HP Updates Data Center Transformation Solutions," August 17, 2011". ^ "Sperling, Ed. "Next-Generation Data Centers," Forbes, March 15. 2010". Forbes.com. Retrieved 2013-08-30. ^ "IDC white paper, sponsored by Seagate" (PDF). ^ "Data centers are aging, unsuited for new technologies". December 10, 2007. ^ In May 2011, data center research organization Uptime Institute reported that 36 percent of the large companies it surveyed expect to exhaust IT capacity within the next 18 months. James Niccolai. "Data Centers Turn to Outsourcing to Meet Capacity Needs". CIO magazine. ^ "Data center staff are aging faster than the equipment". Network World. August 30, 2018. ^ "TIA-942 Certified Data Centers - Consultants - Auditors - TIA-942.org". www.tia-942.org. ^ "GR-3160 - Telecommunications Data Center - Telcordia". telecom-info.telcordia.com. ^ "Tang, Helen. "Three Signs it's time to transform your data center," August 3, 2010, Data Center Knowledge". ^ "This Wave of Data Center Consolidation is Different from the First One". February 8, 2018. ^ "12 New Year's resolutions for your data". ^ "Stop Virtual Server Sprawl". IBMsystemsMagazine.com. ^ "Top reasons to upgrade vintage data centers" (PDF). ^ Delahunty, Stephen (August 15, 2011). "The New urgency for Server Virtualization". InformationWeek. Archived from the original on 2012-04-02. ^ "HVD: the cloud's silver lining" (PDF). Intrinsic Technology. Archived from the original (PDF) on 2012-10-02. Retrieved 2012-08-30. ^ "Gartner: Virtualization Disrupts Server Vendors". December 2, 2008. ^ "Ritter, Ted. Nemertes Research, "Securing the Data-Center Transformation Aligning Security and Data-Center Dynamics"". ^ "Data Center and Server Room Standards". CRAC (Computer Room Air Conditioner) Units: ... kit used ... to support ... Data Center Machine Room Floor. ^ (In this arena, only six companies were noted by Thomas, a financial data publisher) "Computer Room Flooring Water Detectors Suppliers". Thomas Publishing Company. ^ "GR-2930 - NEBS: Raised Floor Requirements". ^ a b "Data Center Raised Floor History" (PDF). ^ "Tips for Ordering Replacement Raised Floor Tiles". ^ Hwaiyu Geng (2014). Data Center Handbook. ISBN 1118436636. ^ Steven Spinazzola (2005). "HVAC: The Challenge And Benefits of Under Floor Air Distribution Systems". FacilitiesNet.com. ^ Victor Kasacavage (2002). Complete book of remote access: connectivity and security. The Auerbach Best Practices Series. CRC Press. p. 227. ISBN 0-8493-1253-1. ^ Roxanne E. Burkey; Charles V. Breakfield (2000). Designing a total data solution: technology, implementation and deployment. Auerbach Best Practices. CRC Press. p. 24. ISBN 0-8493-0893-3. ^ "Telecommunications Infrastructure Standard for Data Centers". ihs.com. 2005-04-12. Retrieved 2017-02-28. ^ "About Data Center". ESDS.co.in (ESDS Pvt. Ltd.). ^ Patrick Thibodeau (April 12, 2016). "Envisioning a 65-story data center". Computerworld. ^ "Google Container Datacenter Tour (video)". ^ "Romonet Offers Predictive Modeling Tool For Data Center Planning". June 29, 2011. ^ a b "BICSI News Magazine - May/June 2010". www.nxtbook.com. ^ "Hedging Your Data Center Power". ^ "Five tips on selecting a data center location". ^ "IBM zEnterprise EC12 Business Value Video". ^ "Strategies for the Containerized Data Center". September 8, 2011. ^ Niccolai, James. "HP says prefab data center cuts costs in half". ^ "tw telecom and NYSERDA Announce Co-location Expansion". Reuters. 2009-09-14. ^ "Air to air combat - indirect air cooling wars". ^ Detailed explanation of UPS topologies "EVALUATING THE ECONOMIC IMPACT OF UPS TECHNOLOGY" (PDF). Archived from the original (PDF) on 2010-11-22. ^ "Cable tray systems support cables' journey through the data center". ^ Mike Fox (2012-02-15). "Stulz announced it has begun manufacturing In Row server cooling units under the name "CyberRow"". DataCenterFix. Archived from the original on March 1, 2012. Retrieved February 27, 2012. ^ "US Patent Application for DUCTED EXHAUST EQUIPMENT ENCLOSURE Patent Application (Application #20180042143 issued February 8, 2018) - Justia Patents Search". patents.justia.com. Retrieved 2018-04-17. ^ "Airflow Management Basics – Comparing Containment Systems • Data Center Frontier". Data Center Frontier. 2017-07-27. Retrieved 2018-04-17. 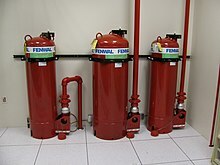 ^ "Data Center Fire Suppression Systems: What Facility Managers Should Consider". ^ Sarah D. Scalet (2005-11-01). "19 Ways to Build Physical Security Into a Data Center". Csoonline.com. Retrieved 2013-08-30. ^ "Data Center Energy Consumption Trends". U.S. Department of Energy. Retrieved 2010-06-10. ^ J. Koomey, C. Belady, M. Patterson, A. Santos, K.D. Lange: Assessing Trends Over Time in Performance, Costs, and Energy Use for Servers Released on the web August 17th, 2009. ^ "Quick Start Guide to Increase Data Center Energy Efficiency" (PDF). U.S. Department of Energy. Archived from the original (PDF) on 2010-11-22. Retrieved 2010-06-10. ^ Greenpeace (2017). "CLICKING CLEAN: WHO IS WINNING THE RACE TO BUILD A GREEN INTERNET" (PDF). ^ Danilak, Radoslav. "Why Energy Is A Big And Rapidly Growing Problem For Data Centers". Forbes. Retrieved 2018-07-06. ^ a b "Smart 2020: Enabling the low carbon economy in the information age" (PDF). The Climate Group for the Global e-Sustainability Initiative. Archived from the original (PDF) on 2011-07-28. Retrieved 2008-05-11. ^ a b "Report to Congress on Server and Data Center Energy Efficiency" (PDF). U.S. Environmental Protection Agency ENERGY STAR Program. ^ A calculation of data center electricity burden cited in the Report to Congress on Server and Data Center Energy Efficiency and electricity generation contributions to green house gas emissions published by the EPA in the Greenhouse Gas Emissions Inventory Report. Retrieved 2010-06-08. ^ Katrice R. Jalbuena (October 15, 2010). "Green business news". EcoSeed. Archived from the original on 2016-06-18. Retrieved 2010-11-11. ^ "Data Center Energy Forecast" (PDF). Silicon Valley Leadership Group. ^ "Efficiency: How we do it – Data centers". Google. Retrieved 2015-01-19. ^ Commentary on introduction of Energy Star for Data Centers "Introducing EPA ENERGY STAR for Data Centers". Jack Pouchet. 2010-09-27. Archived from the original (Web site) on 2010-09-25. Retrieved 2010-09-27. ^ "EU Code of Conduct for Data Centres". iet.jrc.ec.europa.eu. Retrieved 2013-08-30. ^ "UNICOM Global :: Home" (PDF). www.gtsi.com. ^ Daniel Minoli (2011). Designing Green Networks and Network Operations: Saving Run-the-Engine Costs. CRC Press. p. 5. ISBN 9781439816394. ^ Rabih Bashroush (2018). "A Comprehensive Reasoning Framework for Hardware Refresh in Data Centres". IEEE Transactions on Sustainable Computing. ^ a b Peter Sayer (March 28, 2018). "What is the Open Compute Project?". NetworkWorld. ^ Peter Judge (March 9, 2016). "OCP Summit: Google joins and shares 48V tech". DCD Data center Dynamics. ^ "HP's Green Data Center Portfolio Keeps Growing - InternetNews". www.internetnews.com. ^ "Siranosian, Kathryn. "HP Shows Companies How to Integrate Energy Management and Carbon Reduction," TriplePundit, April 5, 2011". ^ Rabih Bashroush; Eoin Woods (2017). "Architectural Principles for Energy-Aware Internet-Scale Applications". IEEE Software. 34 (3). ^ "Bouley, Dennis (editor). "Impact of Virtualization on Data Center Physical Infrastructure," The Green grid, 2010" (PDF). ^ "HP Thermal Zone Mapping plots data center hot spots". ^ "Fjord-cooled DC in Norway claims to be greenest". Retrieved 23 December 2011. ^ Canada Called Prime Real Estate for Massive Data Computers - Globe & Mail Retrieved June 29, 2011. ^ Finland - First Choice for Siting Your Cloud Computing Data Center.. Retrieved 4 August 2010. ^ "Stockholm sets sights on data center customers". Archived from the original on 19 August 2010. Retrieved 4 August 2010. ^ In a world of rapidly increasing carbon emissions from the ICT industry, Norway offers a sustainable solution Retrieved 1 March 2016. 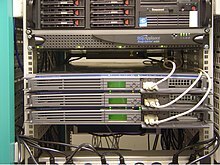 ^ Swiss Carbon-Neutral Servers Hit the Cloud.. Retrieved 4 August 2010. ^ "Data Center Cooling with Heat Recovery" (PDF). StockholmDataParks.com. January 23, 2017. ^ Mohammad Noormohammadpour; Cauligi Raghavendra (July 16, 2018). "Datacenter Traffic Control: Understanding Techniques and Tradeoffs". Communications Surveys & Tutorials, IEEE. 20 (2): 1492-1525. ^ "Protecting Data Without Blowing The Budget, Part 1: Onsite Backup". Forbes. October 4, 2018. ^ "Iron Mountain vs Amazon Glacier: Total Cost Analysis" (PDF). ^ "Iron Mountain introduces cloud backup and management service". September 14, 2017. 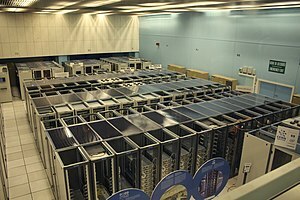 Wikimedia Commons has media related to Data centers. Look up data center in Wiktionary, the free dictionary. DC Power For Data Centers Of The Future - FAQ: 380VDC testing and demonstration at a Sun data center. The European Commission H2020 EURECA Data Centre Project - Data centre energy efficiency guidelines, extensive online training material, case studies/lectures (under events page), and tools.